2018 Oscar has just ended, but leaving a great many of awesome movies like Best Picture Winner Spotlight, The Revenant, which brought the first Oscar Leading Actor of Leonardo DiCaprio and so on. I bet many of you are going to see the movies after the grand ceremony. But how? Most of them are not available on cinema. The best choice is to buy DVDs which is always a common way to enjoy movies. But it has been not as popular as it once was. People prefer to save DVD to Mac for regular playback instead of inserting DVD disk to computer every time, thanks to the ability of Mac OS X working with disk images on hard drive. Usually copying Oscar DVD on Mac is top-drawer to save DVD on Mac computer. 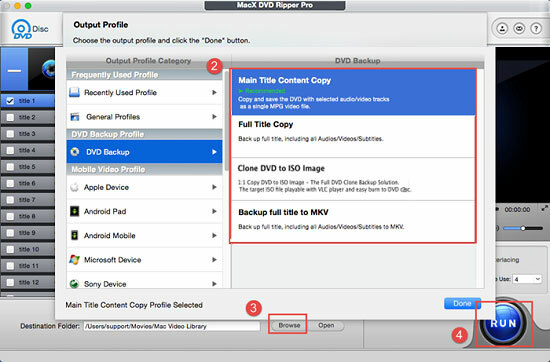 MacX DVD Ripper Pro could settle the matter of saving DVD to Mac computer at one go, which is competent to copy DVD Mac in ISO image, DVD folder, so as to save DVD video to Mac as iSO image and MPEG2 file with 1:1 image quality. It's even hassle-free to copy and save protected DVD to Mac as MP4, AVI, WMV, MKV, MOV, etc for easy playback on iTunes, QuickTime, iPhone, iPad, Android, Apple TV, etc, regardless of copy protections (DVD CSS, region code, RCE, Sony ArccOS, UOPs, Disney X-project protection, etc). So it's a cinch to copy/rip DVDs and save DVDs to Macbook Air/Pro, iMac Mac Mini and other Mac laptops and desktops, be it your non-commercial home-made DVDs or new releases on DVD like Captain America: Civil War, Deadpool DVDs. With hyper-threading and multi-core processing, you can make maximum use of CPU and get DVD saved in digital file format on Mac in minutes, up to 36X real time converting speed. Save Homemade DVD to Mac with 1:1 Cloned or SD Formats? As we mentioned above, Mac OS X (macOS High Sierra) has the ability to work with disc images on the hard drive, which allows you to create a new disc for later use after saving DVD to computer Mac. So 1:1 clone DVD with titles completely can be achieved on Mac. Still, it also common to copy DVD to computer in SD formats like MP4, MOV, AVI, FLV etc. So here comes the issue: 1:1 copy DVD on Mac or rip DVD to SD formats, which is more suitable for you? Normally, if you want to burn DVD later or keep original data like soundtracks or subtitles, save DVD to Mac with 1:1 copied is perfect for you. On the other hand, if you just want to review your DVD at spare time or transfer DVD for iPhone, iPad, Android playback, it's enough to rip DVD to USB, chromebook or others in MP4, MOV, AVI, FLV, WMV etc. No matter which one you choose, this best DVD ripper for Mac will do you a favor with easiest step-by-step tutorial. 1Import DVD Files. Free download the DVD copier and launch it on your MacBook Pro for example. Insert the DVD disc and load it to MacX DVD Ripper Pro by clicking "Add Files" button to get ready for saving DVD to MacBook Pro. 2Choose the output format. Select the target format you want to save DVD to Mac. In general, ISO image are chosen for keeping original data of DVD. Of course, you can also convert DVD on Mac to MP4, MOV, AVI for simple playback. 3Click "Browse" button to save DVD to MacBook Pro wherever you like. 4Click "RUN" button to start ripping DVD to computer. Afterwards, you can eventually play DVD on MacBook Pro or Mac Mini without DVD disc/driver. After the DVD conversion task is finished, you can consider to use MacX MediaTrans to transfer converted DVD movies from Mac to mobile device iPhone iPad in seconds. Certainly, it's also a nice choice if you wanna transfer music from iPhone to Mac or copy photos, videos, ringtone, iBooks, iTunes U, Podcast between iPhone iPad and Mac computer. How to rip copy protected DVD for free? The top encrypted DVD ripper for Mac from MacXDVD is an ideal solution to rip copy encrypted DVD movies on Mac (El Capitan and macOS Sierra) by stripping off the DVD copy protections. Rip protected DVD for free to Mac, MP4, MOV, FLV, MPEG, iTunes, MP3, etc. Have you ever forgotten to return Redbox DVD rentals? Have you ever paid for the RedBox DVD Rental late fee? This guide is about Redbox DVD rental tips, showing you how to rip Redbox DVD free so as to never pay for Redbox DVD rental late fee again. Here's how to speedily rip DVD to NAS drive without losing quality for DVD streaming on stereo systems, DLNA/UPnP compatible iPhone, iPad, Android, Xbox, PS4, TV etc. or backup DVDs on NAS. MacX DVD Ripper Pro is the best DVD copy software which can freely remove any DVD protection and save DVD to Mac with various digital video formats (MP4, MOV, MKV, AVI, FLV, etc) and portable devices (iPhone 7/Plus, iPads, Android). No need to 3rd party to remove DVD encryption tech.